Luciano Pavarotti was hospitalized for observation in his hometown of Modena, in northern Italy, hospital officials there said. Opera star was brought to Modena's Polyclinic two days ago, said manager Terri Robson. 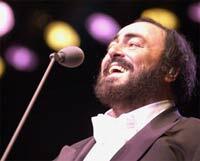 Earlier, a hospital spokesman had said Pavarotti was admitted Wednesday. Robson and officials at the hospital declined to give the reason the 71-year-old tenor was hospitalized, but local daily Il Resto del Carlino reported that it was pneumonia. Robson said she would issue a statement later, reports AP. Pavarotti began suffering from breathing difficulties while on holiday with his wife Nicoletta Mantovani and their daughter Alice near Pesaro on the Adriatic coast, the report said. Pavarotti, underwent an operation around a year ago for a pancreatic tumour and has since been living a quiet life with his family in his home town of Modena, monstersandcritics.com reports.